Japanese week is over. It was fun having a theme as it meant I could buy a lot of the same ingredients for several days and also gave me a chance to think up now things for after the week ended. So far I’ve come up with Pizza. That’s it. I tried making the pizza dough yesterday and it was a disaster so I’m trying again today. It seems so basic I can’t work out what went wrong so here goes – I used Jamie Oliver’s Pizza Dough recipe so what’s the worst that could happen. I stopped at the store for flour as I didn’t have any Strong Flour in the house. Turns out I did. 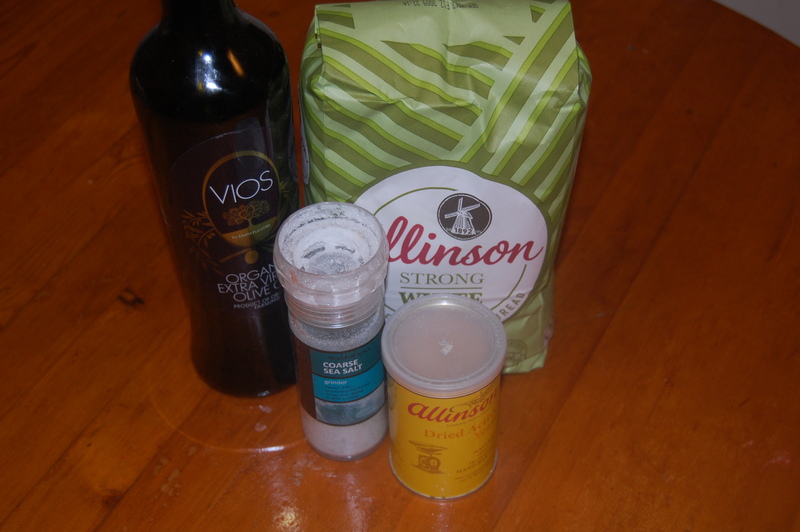 I now also have a second bag of strong flour, several magazines, a sandwich, popcorn, a phone cover and an empty purse. Sieve the flour and salt onto a clean work surface. Make a well in the centre. In a jug mix together the yeast, oil, sugar and water. Leave for a few minutes to dissolve and mix together. Pour the liquid mixture in to the well and gradually bring the flour in with a fork. It should start coming together to form a dough. When this starts, work it in to a ball using your hands. Make sure they are dusted with flour to prevent the dough sticking. 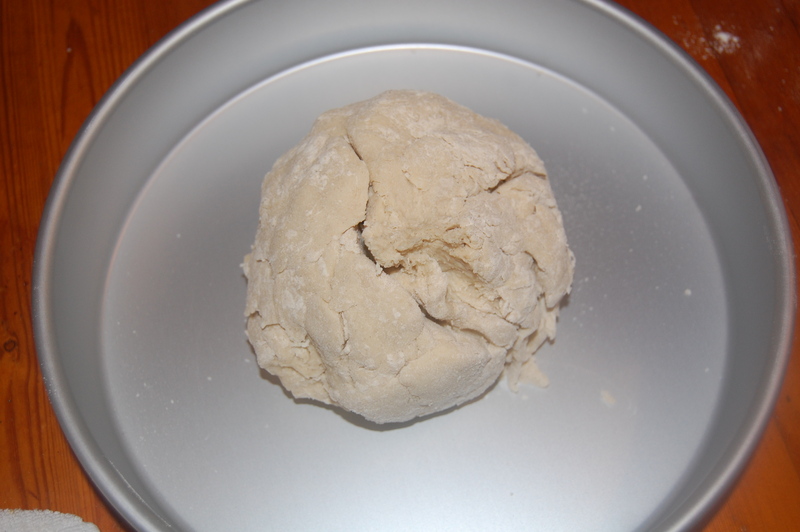 Place the dough in a flour dusted bowl, dust with flour then cover with a damp cloth. Leave to proove for an hour in a warm room, until the dough has doubled in size. Take the dough out onto a floured surface and knead a bit to remove the air – this is called Knocking Back. The dough is good to go. Top with a selection of goodies – We went for Milano Salami, Streaky Bacon, Chipolatas, Basil and Mozzarella. I baked for 20-30 minutes, checking regularly. I am never, ever making Pizza Dough again. Second time and it was just as bad. I’ve Googled it since and the problem is potentially yeast related. There was no froth. 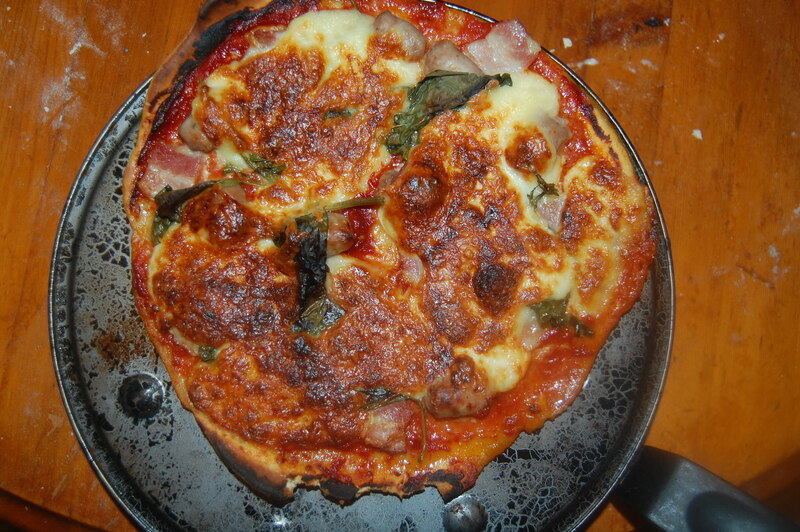 Neither attempts rose, and when I cooked the second attempt it was shiny and none of the toppings would stick. Tasted lovely though. Tonight we needed an easy meal, something we had in the house and that didn’t need a hundred and one new ingredients. Bolognese was the answer. This bolognese is my bolognese. I don’t have a recipe and it’s unlikely to be accurately ‘Italian’. But it tastes good, cooks quick and fills you up better than bread. I’d love to make a true Italian Bolognese just to see how they compare but to be honest, this tastes like bolognese to us and it tastes good so who cares if it’s not true Italian. 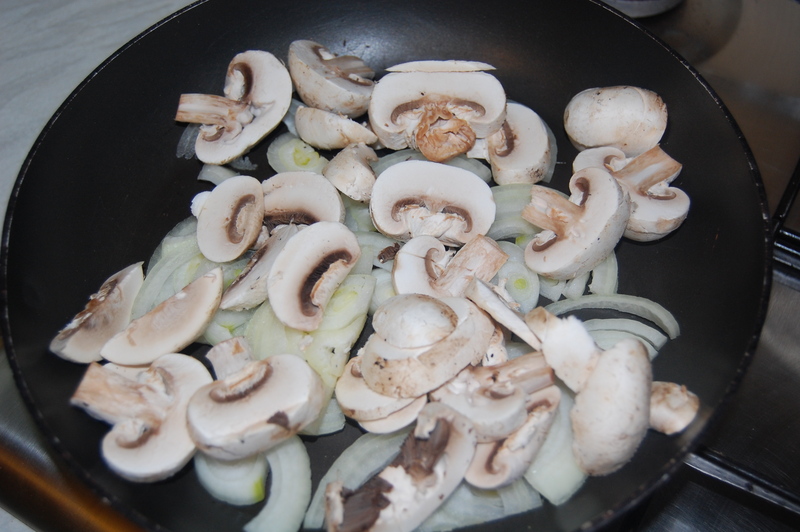 Gently fry the onion and mushrooms in a frying panuntil soft. Drizzle with oil and add a crushed garlic clove or two. Put to one side. 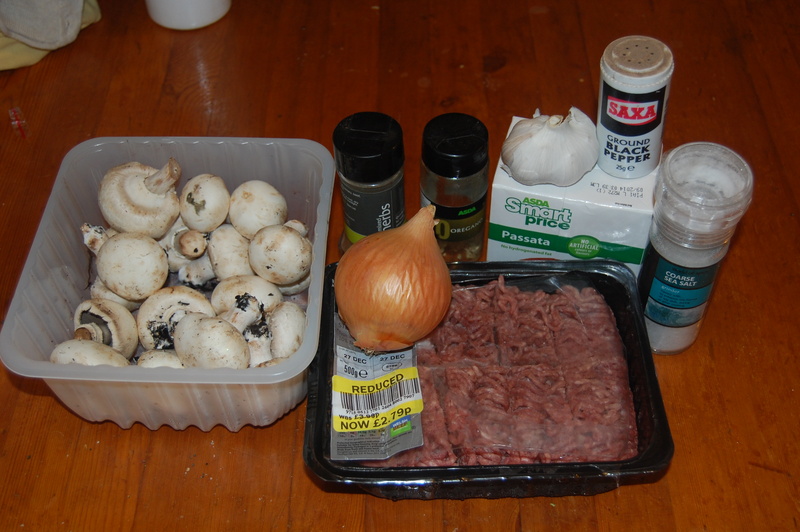 Cook off the mince until brown. Add salt and pepper. 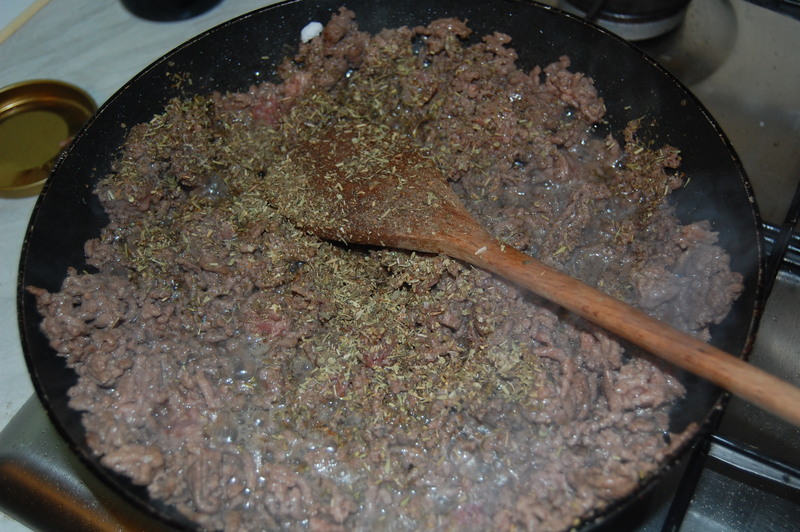 Add the oregano and mixed herbs to taste. 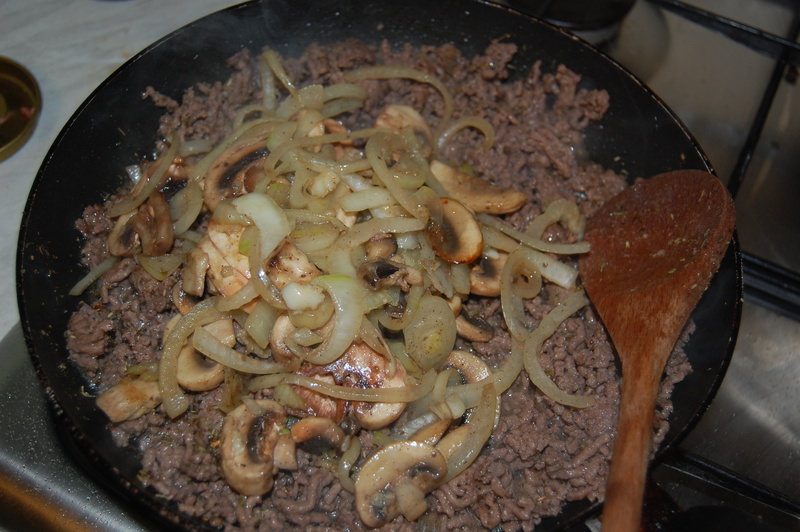 Add the the mushrooms and onions back in a stir while continuing to heat. 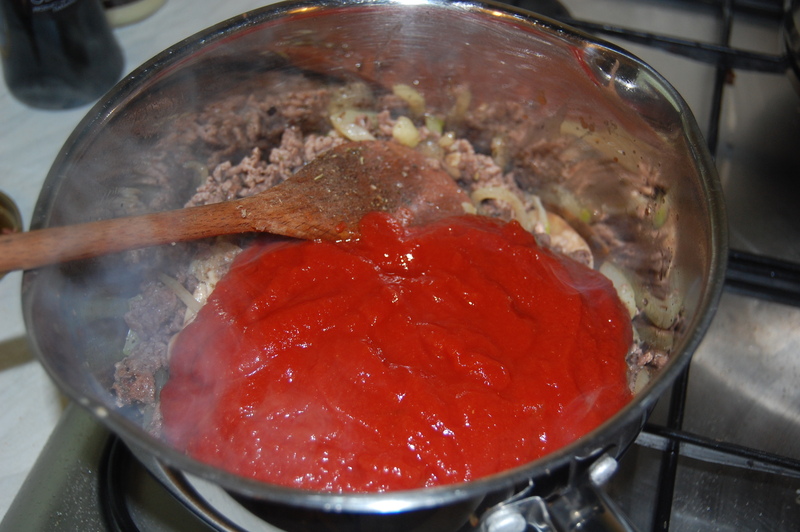 Add the carton on passata. Stir through. 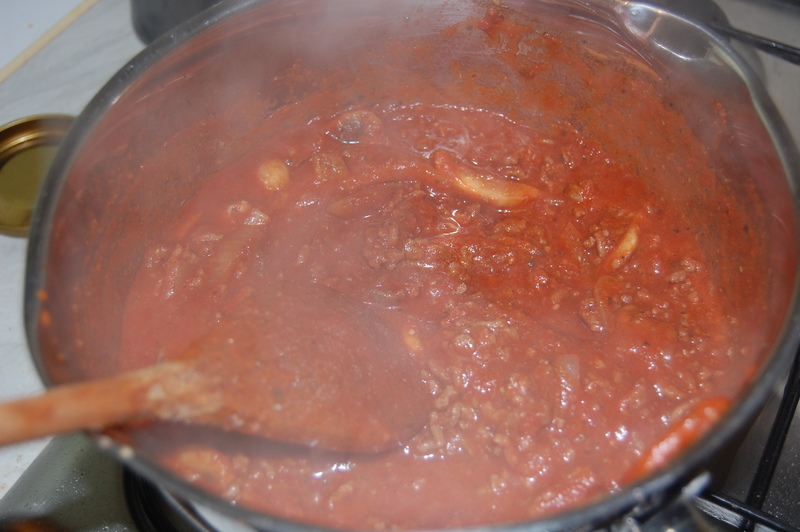 Leave to simmer and reduce down until the sauce becomes thicker. And that really is it. 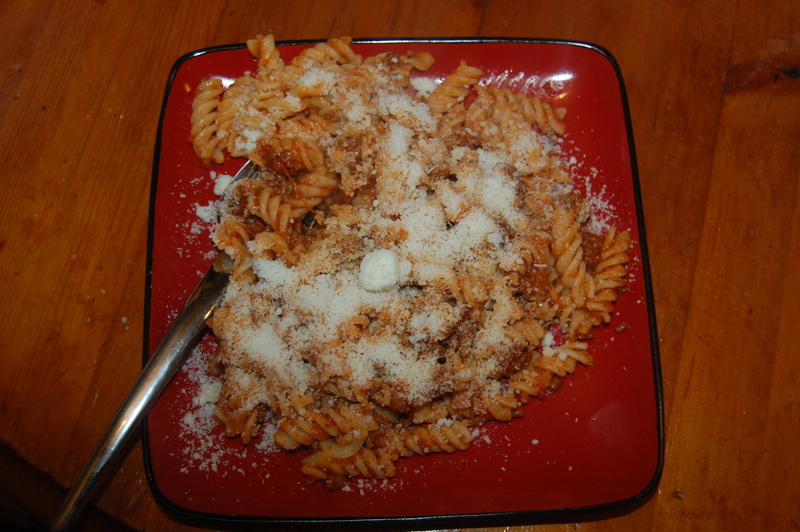 Cook up some pasta, stir it in and serve caked in parmesan. Garlic bread optional.